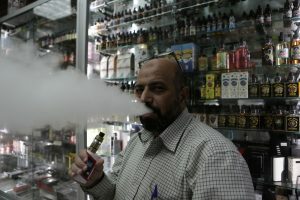 WASHINGTON – A House panel is again trying to exempt increasingly popular e-cigarettes from new Food and Drug Administration rules. The legislation approved Wednesday by the Republican-controlled Appropriations Committee would prevent the FDA from requiring retroactive safety reviews of e-cigarettes already on the market. It would exempt some premium and large cigars from those same regulations. E-cigarette products introduced in the future would face the safety reviews. The development comes as the Trump administration has delayed enforcement of the new FDA rule and the e-cigarette industry is hopeful that efforts to roll back the Obama regulations will advance both as legislation and through several pending lawsuits. Supporters say that “vaping” is far safer than smoking tobacco cigarettes and that the products, which generally heat a liquid nicotine solution into vapor, can help tobacco smokers quit. They say FDA rules would lead small companies that produce the products to go out of business rather than undergo expensive regulatory reviews. READ MORE: Does vaping save smokers or create new nicotine addicts? But most panel Democrats said the products are dangerous and are targeted at children. “While we do not know what is in e-cigarettes, study after study finds that most show high levels of formaldehyde and other cancer-causing chemicals,” said Rep. Nita Lowey, D-N.Y., who said the products are geared toward getting children hooked on nicotine with flavors such as Fruit Loops and Gummy Bears. “The FDA would never be able to put the genie back in the bottle, unable to regulate or even know what is in these products, forever,” Lowey said. A move by Lowey to defend the FDA rules was blocked by a 30-22 vote. The provision to undercut the FDA rules was attached to legislation funding the agency’s budget for the fiscal year starting in October. Democrats succeeded earlier this year in blocking the move to exempt existing products on an earlier spending bill. Public health groups say the regulations could allow many newer tobacco products to escape scrutiny just as more people, including teenagers, are using them. Cigarette smoking has decreased in recent years, but vaping and cigar smoking have risen. The nicotine-infused vapor of e-cigarettes looks like smoke but doesn’t contain all the chemicals, tar or odor of regular cigarettes. The FDA rules will require e-cigarette brands marketed since February 2007 to undergo premarket reviews retroactively. The FDA will then ensure the product is “appropriate for the protection of the public health.” If not, the agency could take it off the market. Left: Manager of Brooklyn Vape store Mohammed Isa smokes an e-cigarette in Brooklyn, New York, U.S., January 18, 2017. A House panel is again trying to exempt increasingly popular e-cigarettes from new Food and Drug Administration rules. Photo by REUTERS/Joe Penney.